Stidham is best known for his role as math wiz Sylvester Dodd in the TV series Scorpion, but he’s a bit of a renaissance man. He writes music and plays in a band, DRTV, and has now also moved behind the camera, with this, his debut feature. It’s a low-key horror film, that relies more on atmosphere than gore, yet has a decent idea at its core, and works well, given its resource limitations. It’s a light piece, which aims for as many comedic moments as horrific ones. In particular, there’s siren-hunter Gaspar Poisson, whom we first meet in a prologue, then shows up to provide the necessary exposition, and Nick’s trio of friends, who are filming a disco version of the Frankenstein myth in their garage (it’s as deliciously awful as it sounds). On the other side, it’s understated on the horror, I suspect for reasons of resources as much as anything, yet this is not ineffective. The fact that the siren’s victims are, literally, there one second and gone the next, is undeniably creepy; your imagination likely fills in the blanks about what happened to them, better than any low-budget splatter could do. Stidham’s way of shooting the pool also makes it seem more ominous than you’d expect, and the other main positive here is decent characters. I’m now at the age where it’s a success if a film with a young cast doesn’t leave me wanting to punch them in the face. Not much of that here, with even the inevitable party jackass considerably less annoying that many I’ve seen. In particular, Nick, Katie and Jenna are believable as siblings, whose frequent bickering conceals a deep affection for each other [their parents are no longer around to take care of them, though again, this seems more expediency than anything]. In other words, they seem like real people, which is less common in the horror genre than it should be. 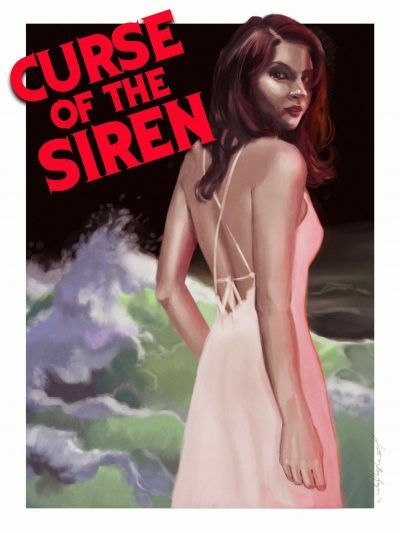 Coincidentally, it’s the second update of the siren legend I’ve seen this year, following C. Thomas Howell’s Siren Song, also known by the rather less-subtle title of Blood Lust. This makes rather more effort, not just with the pool angle, but things like the mechanism of avoiding enchantment, which offers a neat modern twist on the “stopping your ears with wax” approach adopted by Odysseus. If not pushing any envelopes, Stidham has avoided the majority of the pitfalls common to feature debutants, and you sense he has used his time on the set of Scorpion to observe, as much as act.